Whether you are visiting us for research or attending a program, we welcome you to the Byrd Center. Conveniently located at the heart of Shepherd University's campus and close to historic Shepherdstown's downtown restaurants and shops, the Byrd Center is easily accessible. ​For those visiting us during business hours (9am-5pm), you will need to register your vehicle with Shepherd University Campus Police (304-876-5202) and park in the designated visitor lot on West Campus. A bus regularly runs between east and west campus throughout the day. If you are visiting us for an evening program, parking on east campus is available in C-lot, accessible from Duke Street (WV 480) across from the Bavarian Inn. Take I-70 West (Baltimore) or I-270 West (Washington D.C.) to Frederick, Maryland. Take U.S.-340 West towards Harpers Ferry/Charles Town. Follow to Charles Town, then take WV-9 West and follow to the "Kearneysville" Exit (WV-480 North). Follow into Shepherdstown, turn right at 4-way stop onto East German Street, turn left onto North King Street, and the Byrd Center is located on your right (next door to the university library). Take I-68 East to Hancock, Maryland. Take I-70 East to Hagerstown, MD. Take I-81 South to Martinsburg. Take exit for WV-45/WV-9 East towards Charles Town and follow to the "Kearneysville" Exit (WV-480 North). 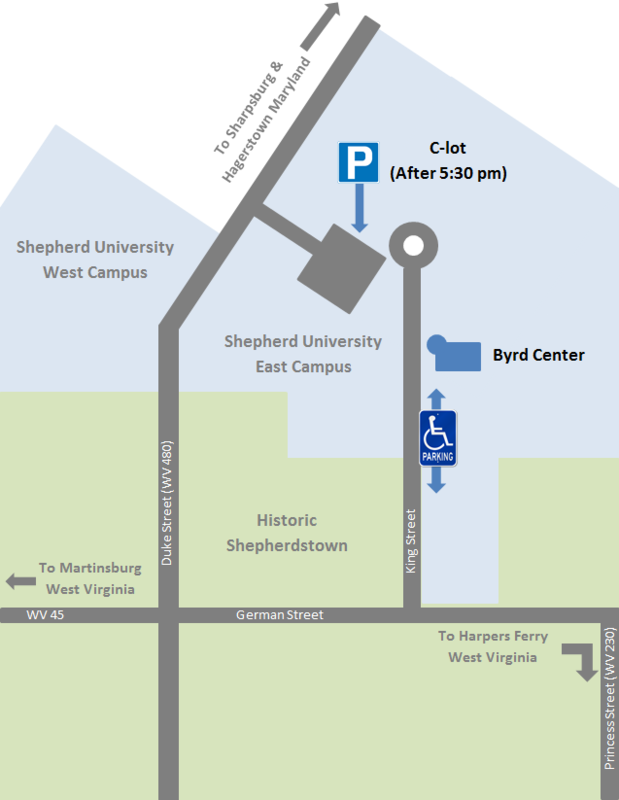 Follow into Shepherdstown, turn right at the 4-way stop onto East German Street, turn left onto North King Street, and the Byrd Center is located on your right (next door to the university library).